Rockstar wrote: "We gather today to welcome five kits into their lives as apprentices." continued Rockstar once the clan had gathered. "Thistlekit, you will be known as Thistlepaw. Ripplefoot, you will be mentor to Thistlepaw. Willowkit, you will be known as Willowpaw. Lynxbranch, you will be mentor to Willowpaw. Crystalkit, you will be known as Crystalpaw. Brokenstripe, you will be mentor to Crystalpaw. Hotkit, you will be known as Hotpaw. Scarletfur, you will be mentor to Hotpaw. Kestrelkit, you will be known as Kestrelpaw. Skyleg, you will be mentor to Kestrelpaw." Thistlepaw let out a loud purr and padded over to Ripplefoot. "Let's go check out the territory." meowed Ripplefoot as she touched noses with Thistlepaw. Willowpaw yawned loudly and slowly made his way over to Lynxbranch. "Ready to learn how to hunt?" meowed Lynxbranch as she touched noses with Willowpaw. Crystalpaw let out a loud purr and padded over to Brokenstripe. "Let's go work on some fighting moves." meowed Brokenstripe as she touched noses with Crystalpaw. Hotpaw gave a little wiggle before padding happily over to Scarletfur. "Mind if we come with you?" meowed Scarletfur to Ripplefoot. Kestrelpaw swiped his tongue around his jaws as he made his way over to Skyleg. "Go pick out a nest before your littermates get there." meowed Skyleg as he touched noses with Kestrelpaw. "Thistlepaw, Willowpaw, Crystalpaw, Hotpaw, Kestrelpaw!" cheered Brookbelly for the clan's newest apprentices. Brokenfall padded past her clanmates and into the nursery, squeezing inside carefully. Once inside, she dipped her head to the other queens and settled into an empty nest. Sharkear pricked up his ears and padded over to hear what Rockstar had to say. "We gather today to welcome five kits into their lives as apprentices." continued Rockstar once the clan had gathered. 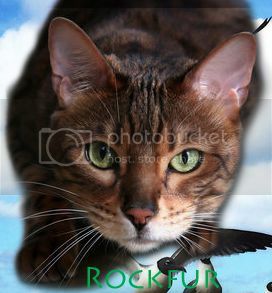 "Ravenkit, you will be known as Ravenpaw. Brookbelly, you will be mentor to Ravenpaw. Redkit, you will be known as Redpaw. Brightmuzzle, you will be mentor to Redpaw. Bloodkit, you will be known as Bloodpaw. Desertcloud, you will be mentor to Bloodpaw. Oceankit, you will be known as Oceanpaw. Echotail, you will be mentor to Oceanpaw. Deadkit, you will be known as Deadpaw. Deathflight, you will be mentor to Deadpaw." Ravenpaw sat up proudly, then got to her paws and padded over to Brookbelly. "Let's go check out the territory." meowed Brookbelly as she touched noses with Ravenpaw. Redpaw got to his paws and padded over to Brightmuzzle. "Ready to learn how to hunt?" meowed Brightmuzzle as he touched noses with Redpaw. Bloodpaw puffed out his chest and padded over to Desertcloud. "Let's go work on some fighting moves." meowed Desertcloud as she touched noses with Bloodpaw. Oceanpaw puffed out her chest and padded over to Echotail. "Mind if we come along?" meowed Echotail to Brookbelly. Deadpaw snorted to himself, then padded over to Deathflight.